166,500 SF four story facility with 20 classrooms, a 350 seat auditorium and nearly two dozen collaborative spaces. 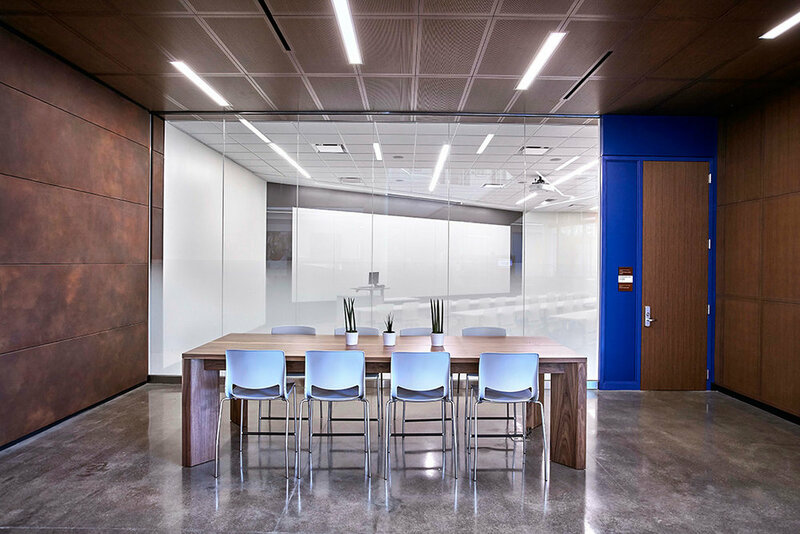 M&H worked closely with local architecture firm Gastinger Walker during the design development phase of the project. M&H assisted with the project specifications and samples. The design team and owner’s representatives visited the M&H architectural concrete showroom multiple times to discuss project particulars and review samples until the team was able to fine tune the project finishes. 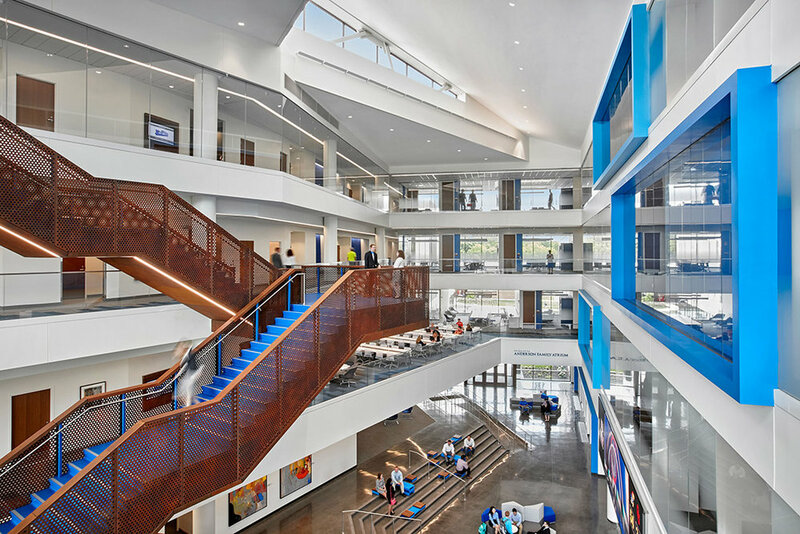 The atrium lobby, common area, and gathering space of the new four story, 166,500 SF facility was completed with the Bomanite Renaissance system. The large common area in the atrium lobby was designed to be a living room-like “entrepreneurship incubator.” M&H placed 15,800 SF of 4” thick integrally colored topping slab. The slab was integrally colored with Bomanite’s “Coal Gray”. The placement of the topping slab included multiple sets of cast-in-place steps as well as an ADA accessible ramp. 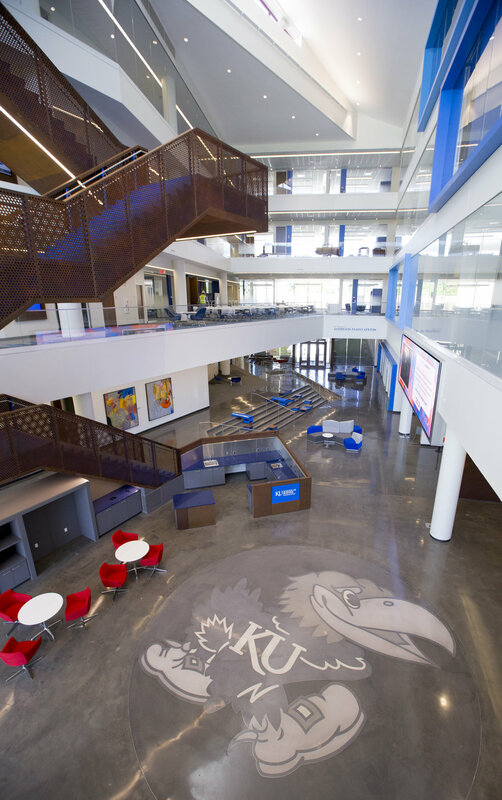 The center piece of the project, and building as a whole, is the 24’ diameter Jayhawk symbol at the west entry of the atrium lobby which M&H installed. The Jayhawk overlay involved the installation of an intricate zinc inlay of the Jayhawk. Musselman and Hall utilized a polishable overlay for the Jayhawk. After the topping slab had cured sufficiently, M&H began the polishing operation. The slab was ground to a “salt & pepper” aggregate exposure and polished a semi-gloss finish. The schedule allowed for the polishing operation was extremely tight and a 12 man polishing crew worked 10+ hour days for 2 weeks straight to meet the aggressive schedule. Musselman & Hall is very proud, especially Vice President of Architectural Concrete Dan Kroesen (pictured 6th from the left) who was the project manager for this project.